W e at LH InTouch stand for People Business, Quality Leader, International Team Spirit, Individual Caring and being A Lufthansa Company. These are our Core Values. They shape our corporate culture. They reflect our corporate identity and set the basis for how we treat our colleagues, our customers and our business partners. But – our Core Values can only reveal their true meaning by the way they are lived by our employees, day-by-day. To find out how and involve our colleagues, a project team, with Antonella Grippi and Corinna Behr at the helm, launched a global initiative. Antonella is an Office Coordinator based in Dublin, while Corinna holds the position of Group HR Manager and is based in Berlin. “The response was amazing, we received about 50 selfie clips, either by individual colleagues or teams”, says Antonella. “About 75 colleagues from all over the world shared what working at Lufthansa InTouch means to them. 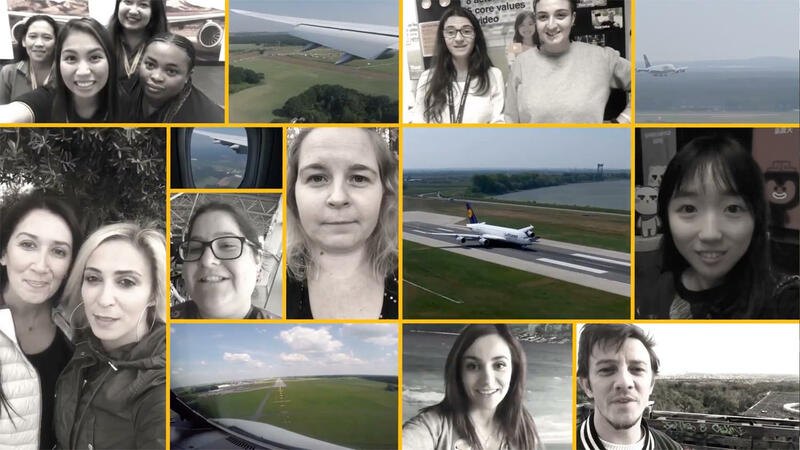 They sent their fun and creative videos – and brought our Lufthansa InTouch Core Values to life!” Viewing and combining the clips has been an incredible journey around the world. Keen to have a sneak peek? Enjoy our small selection taken from those 50 videos! Click the play button and join us for a quick trip around the Lufthansa InTouch world.